A native of Berkeley, California, Anne Donahue studied sports psychology the University of Oregon and competed in club sports: rowing and ultimate frisbee. "Our ultimate team, Dark Star, finished third at the national championships," she says. After graduation, she went into business, printing t-shirts in her garage, until it caught fire. She took care of a woman with MS and did housecleaning and landscaping. "I love working in the dirt," says Donahue, who started as a volunteer at the City of Eugene's River House compost education site, then completed master gardener training, and in 1999 became a full-time compost educator. "It was a dream job for me," she says. "I got paid to shovel manure." She worked for the city until 2013, specializing in urban agriculture and waste prevention. A decade ago, she and her domestic partner Chris Donahue started a garden on unused 21st Avenue right-of-way adjacent to their home on Van Buren Street. In 2009, they enlisted neighbors, landed a $5000 matching grant from the city, and established Common Ground Garden to grow free veggies for the neighborhood. 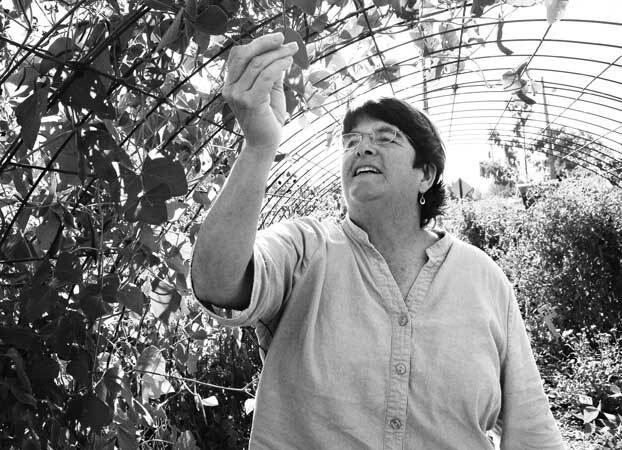 "It's my hobby job," says Anne Donahue, who manages the garden. "People bring us food scraps to make compost. We had 12 volunteers at last week's work party." The Northwest Permaculture Convergence, happening in Eugene this weekend, includes a tour of Common Ground Garden, at 21st and Van Buren, free and open to the public at 1pm on Friday, August 28. On September 20, the garden will be a featured venue for the Eugene Sunday Streets event in the Friendly Neighborhood, hosting a raffle, a seed giveaway, and a bake sale.